This Cutonion Raita is very quick and easy to prepare. 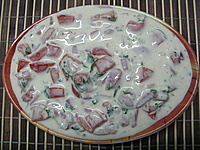 Raita is a yogurt based Indian recipe. This one is a pyaaz tamatar raita or in other words onion and tomato raita. It is a good accompaniment to a rice, meat or vegetarian dish. Make it as mild or hot as you want. It tastes fabulous.This is a completely healthy recipe (no oil), if you use a low fat yogurt. Put all the chopped ingredients in a bowl and mix together. With a balloon whisk or fork, gently whisk the yogurt to make it smooth. Add the salt, sugar and cumin powder. Tip over the yogurt in the chopped ingredients and stir gently to mix everything. Check the seasoning. Garnish with a mint or coriander leaf. Serve chilled.